A simple, sweet sparkling white wine with none of the yeasty tastes that you often get in Italian fizz at this end of the price range. All in all, very nice indeed. A refreshing wine for a hot summer's afternoon. Maria says: We should buy some more. 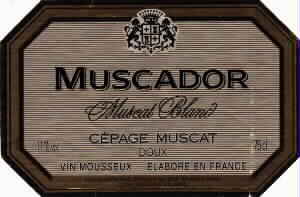 Muscador Muscat Blanc, Cepage Muscat, Doux, Vin Mousseux. FrF9.95 from Super U France.